Product Details Actors: Chris Robinson; John Wilson Directors: Tim Tonner Format: Color, Full Screen, NTSC Region: Region 1 (U.S. and Canada only. Read more about DVD formats.) Number of discs: 1 Studio: Barking Lobster Entertainment DVD Release Date: August 1, 2005 Run Time: 30 minutes Average Customer Review: 4.9 out of 5 stars See all reviews (12 customer reviews) ASIN: B000AOVQYK Amazon Best Sellers Rank: #596,472 in Movies & TV (See Top 100 in Movies & TV) Did we miss any relevant features for this product? Tell us what we missed. Would you like to update product info, give feedback on images, or tell us about a lower price? Most Helpful Customer Reviews 1 of 1 people found the following review helpful 4.0 out of 5 stars Fun for all ages! June 13, 2005 By S. Taylor Format:DVD Having received this video as a gift, we watched it as a family, accompanied by a lot of laughter and “I didn’t know that”. The kids managed to show this to most of their friends, the youngest even taking it to school where his 1st grade teacher used it as a part of her unit on Careers. The video is an overall winner. Anyone, any age, will enjoy the playful and informative story and all will come away with a greater understanding and respect for both the lobster and the lobsterman. BUY IT! Comment | Was this review helpful to you? Yes No 5.0 out of 5 stars Really fun! December 18, 2006 A Kid’s Review Format:DVD I really liked learning about how to catch lobsters. It looks like Lobsterman Chris works very hard, but he seems to also love what he does. My favorite pictures were the blue lobster, and watching the lobster crawl into the trap. 5.0 out of 5 stars Educational and Entertaining September 28, 2006 By DomesticLaura Format:DVD My nephews (2 and 4) absolutely love this video. The 4 year old knew all about the parts of the lobster and the trap after watching this video twice. He pretends to be a lobsterman all the time now. I highly recommend this video, especially if you live near or travel to areas with a lobster industry! Comment | Was this review helpful to you? Yes No 5.0 out of 5 stars Two claws up! December 12, 2005 By Robert Holden Format:DVD I checked out “Let’s Go Lobstering!”, and immediately began to wonder how a DVD like this one managed to escape my attention for so long. I am a fourth-grade science schoolteacher and I like to incorporate interesting video into my cirriculum, to make learning more enjoyable for my very curious students. I spend a great deal of time looking for DVDs that I believe would adequately fit into my classes, often times coming up empty-handed because alot of the videos I come across are terribly mediocre. 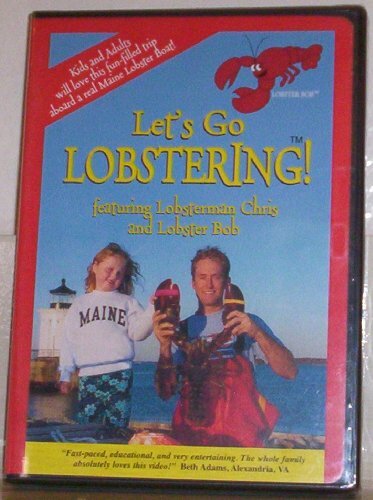 “Let’s Go Lobstering!”, however, represents everything I could hope for in a DVD. Very educational, excellent scripting, wonderful footage, and a somewhat unusual subject—there are not many DVDs, as far as I know, that cover the Maine lobsterman. Books maybe, but not videos. And this one is way above-average, worthy of a five-star rating all day long! Thanks Barking Lobster Entertainment for enriching my students’ learning experience. I can’t get over how great this DVD is! I found the 30-minute length ideal for my kids, who are ages five, seven, and nine, but more importantly, the information on how to catch lobsters was so interesting. We all loved seeing how traps and buoys work, how they set the traps, etc. The underwater shot of a blue lobster was very cool! Nice job! Comment | Was this review helpful to you? Yes No 5.0 out of 5 stars A great learning experience! December 11, 2005 By Helen Moore Format:DVD After watching “Let’s Go Lobstering!”, I am almost saddened by the fact that there are not more DVDs like this for children to enjoy. I review children’s videos for a living, and have seen my share of overly produced, too slick, too clever, absurdly scripted videos. This is not one of them. Rather, it develops the subject matter, a day in the life of a Maine lobsterman, intelligently. We see fantastic shots of “Lobsterman Chris” working his boat, and telling his viewers what is going on, set against a beautiful Maine background. Other narrators provide important facts as the video progresses, often highlighted by graphics that appropriately fade in to assist the learning process—a simple formula, but it works beautifully. Without question, “Let’s Go Lobstering!” is a winner! Fun for all ages! Having received this video as a gift, we watched it as a family, accompanied by a lot of laughter and “I didn’t know that”. The kids managed to show this to most of their friends, the youngest even taking it to school where his 1st grade teacher used it as a part of her unit on Careers.The video is an overall winner. Anyone, any age, will enjoy the playful and informative story and all will come away with a greater understanding and respect for both the lobster and the lobsterman. BUY IT! A Kid’s Review I really liked learning about how to catch lobsters. It looks like Lobsterman Chris works very hard, but he seems to also love what he does. My favorite pictures were the blue lobster, and watching the lobster crawl into the trap.